As the name suggests a Variable rate mortgage is characterised by its interest rate which varies with the lender's SVR, see below for details on the SVR. Variable rate loans are old school mortgages and were one of the few styles of home loans before the industry got both sophisticated and aggressive, pre 1985. 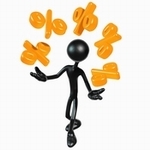 Different mortgage styles are charged at different interest rates. For example, a base rate tracker is based off official Bank of England rates, a fixed rate mortgage has its interest rate fixed etc. But of all the interest rates to pay a lender's SVR (Standard Variable Rate) is normally the most expensive. And for this reason smart mortgage buyers when faced with the prospect of paying the SVR will always try to remortgage to a better deal. Don't be worried about paying your lender's SVR for short periods of time. For example, you might have taken out a 3 year fixed rate mortgage which has just expired with your interest rate about to be set at your lender's SVR. But if you expect interest rates to fall over the next 6-12 months before locking in another fixed rate deal then stay on the SVR and remortgage if/when rates fall. To summarise - paying the SVR for short periods of time is nothing to be worried about, but if you pay it for many years you're probably wasting a lot of money. Variable rate mortgages are generally a relic of the past. So bend with the times and look to other mortgage styles which are cheaper.